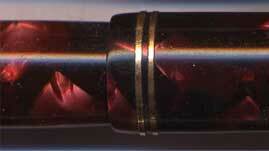 n July 1932 Parker's high end pen, the Golden Arrow, was introduced. It was followed by very swift name changes. 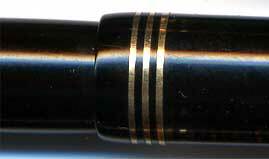 In December 1932 the name was changed to Vacuum Filler and in June of 1933 the name Vacumatic was adopted to the new model. The plunger could be locked in a down position with a twist of the thumb. And is referred to as the Lock-Down Fill, or Twist-Fill. 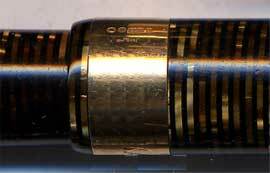 A short blind cap that sported a tassie ring and a "jewel" was also fitted. he lockdown models came with three different styles of cap rings. A fat band, a two ringed version or a three ringed version. Click on image with the correct number of rings!